I don’t mean to hit a sour note as we approach this time of collective gratitude and feasting, but am I the only one who finds traditional pumpkin pie underwhelming? Not that I have anything against pumpkin, per se. I mean, it’s a great squash and all. But it’s a little blah. 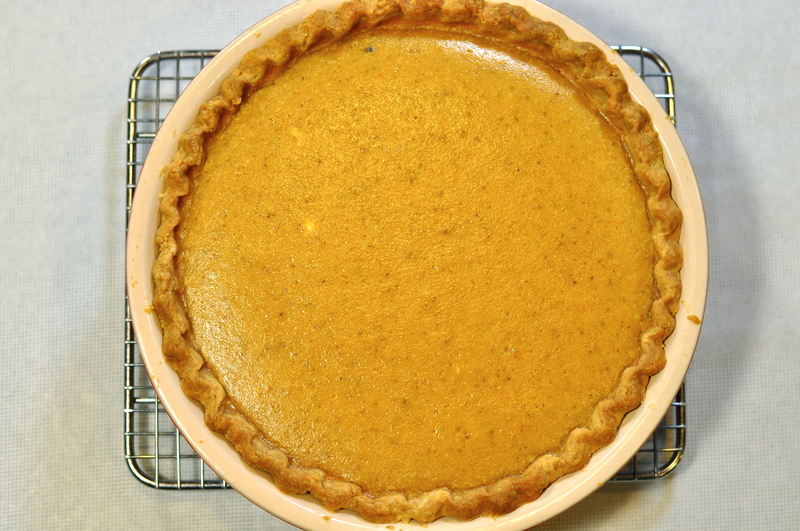 And most pumpkin pies only go about halfway as far as they could – in the richness and wow! departments – to un-blah it. It’s as if – when the Pilgrims got together to plan the Thanksgiving Day menu – the dessert committee said “Whoa! We better not invent anything that’s going to upstage the turkey, dressing and green bean casserole! Better keep it plain, ladies.” Thus, boring pumpkin pie was born. Well I think it’s time we stepped back and gave this national treasure a makeover. I propose we adopt this Creamy Pumpkin Cheesecake Pie as the gold standard. Relax: we’re not thumbing our nose at tradition here. 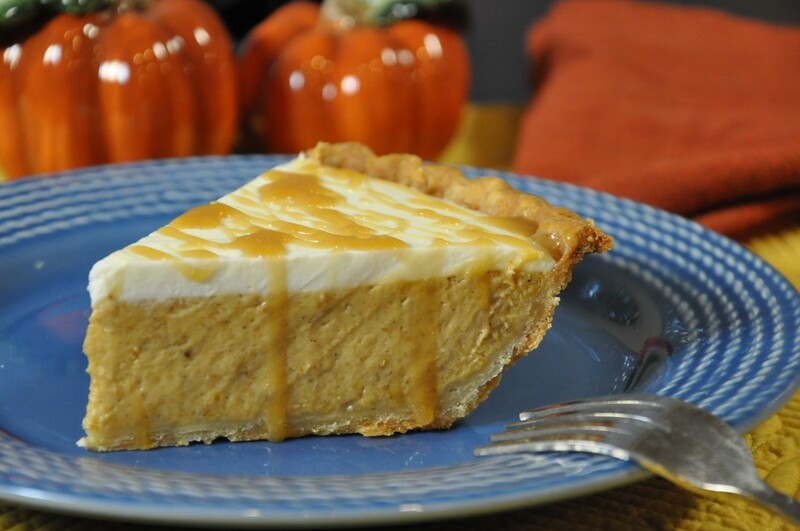 We’re simply stepping on its toes so pumpkin pie seems less like an afterthought and more like a starring attraction. We gather our ingredients, which – you will note – looks like the congregation of any pumpkin pie in the making, save for the cream cheese, which gives this pie its uncharacteristic creamy richness. Our partially prebaked pie shell is the to right. I get frequent emails asking me if it’s really necessary to prebake your pumpkin pie shell, and the answer is yes, unless you really like limp crusts. End of story. And by the way, see the white smears on the shell above? Those are dabs of cream cheese that a rub over the holes to plug them so the filling doesn’t run out. I like a little lemon zest in my pumpkin pie. It adds a bit of sparkle. 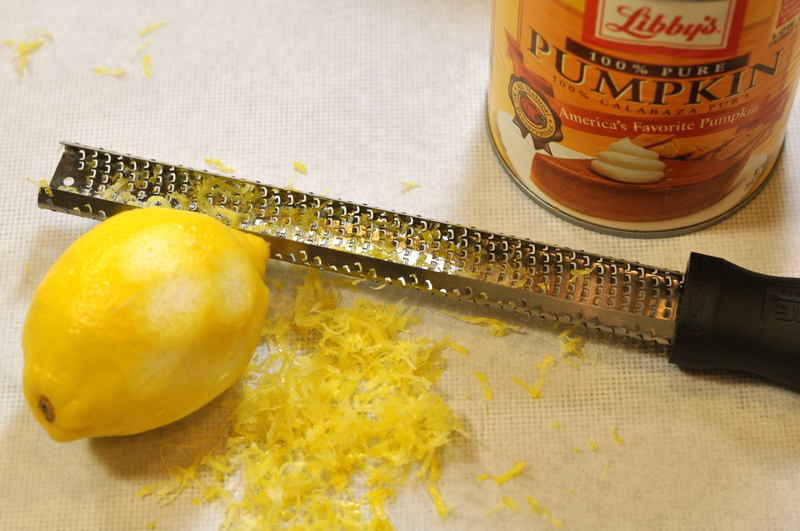 A pumpkin pie should wear lemon like a guy wears cologne: you should barely know that it’s there. You want just enough to add interest; not enough to make a statement. If you don’t have one of these Microplane graters, you should pick one up. They’re sharp and efficient, like a grater on steroids. 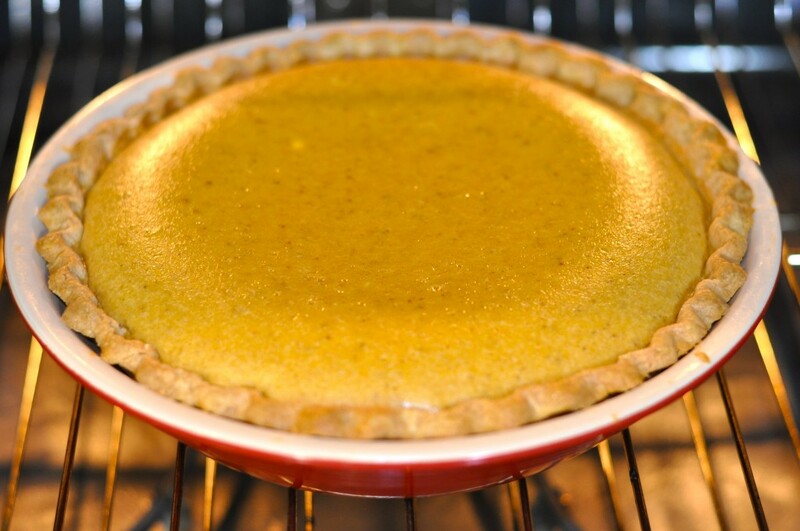 Whether you’re baking this or almost any pumpkin pie, the visual clues to done-ness are essentially the same: first, the top of the pie will “lift” a little, more so at the sides. You don’t want a really big lift, or you may end up with a crack in the pie. Also, see in the photo how the perimeter of the pie has a “flat” texture, while the center is more moist-shiny? That’s what you want. This photo – taken about 5 minutes before the pie is done – illustrates the difference pretty well. When your pie is done, expect to see only a small shiny circle – a couple of inches in diameter – at the center of the pie. As you pie cools down, the top will settle and the surface will take on a uniform texture and appearance like it has in the photo below. You could serve the pie just like this, but I think the sweetened sour cream topping gives the pie a really attractive finish…not to mention the fact that it eliminates the need for whipped cream. I like to drizzle slices with a little butterscotch or caramel sauce when I serve the pie. Sour cream topping or not, you’ll need to start this the day before because it has to refrigerate overnight. That’s just as well: it leaves you more time on the big day to attend to more pressing matters. Here’s wishing you and yours a warm, cozy, and otherwise fabulous Thanksgiving. And in case you’re wondering, one of the things I’m most grateful for this year is you and the many other pie lovers and Pie Academy members who have generously shared their ideas, challenges, compliments, and hopes for this site. Thanks for your support. 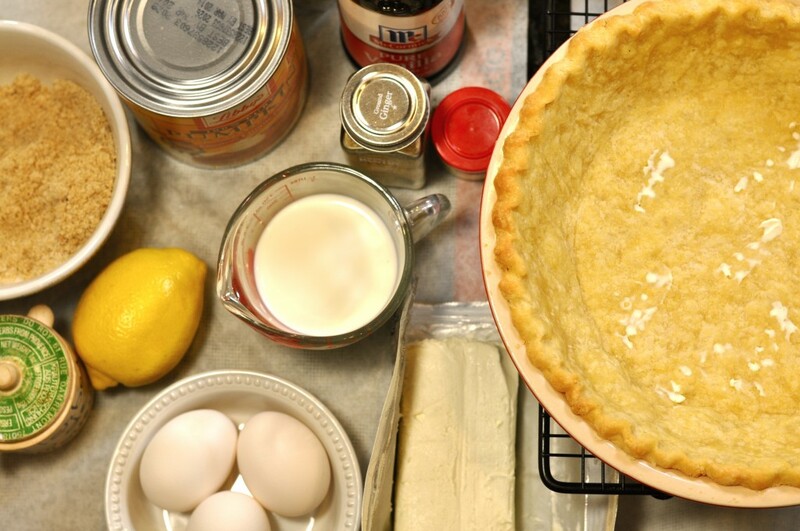 PASTRY NOTE: Use any pastry you like here that will fit a 9 1/2″ deep-dish pie pan. I like the GOOD BASIC PIE DOUGH. ANOTHER NOTE: Careful observers will note that this is week 11 in our parade of tailgate pies. I’m simply playing that down this week, in favor of Thanksgiving. However, so long as you can keep this cold, it would make a great tailgate pie. On a sheet of lightly floured wax paper, roll the pastry into a 13" to 13 1/2" circle. Invert the pastry over a 9 1/2" deep-dish pie pan, center, and peel off the paper. Gently tuck the pastry into the pan, without stretching it, then pinch the edge into an upstanding rim. Place in the freezer for 20 minutes while you preheat the oven to 400°. To make the filling, make sure the oven is still set to 350°. Using an electric mixer, cream the cream cheese until light and smooth, gradually adding the sugar and brown sugar. Blend in the eggs, about 1/3 at a time. Add the vanilla, lemon zest, spices and salt. Blend until evenly combined, but don't overbeat (beating too much at this point could make your pie crack because you'll whip air into the eggs.) Finally, blend in the pumpkin puree and half-and-half. Pour the filling into the pie shell. Place on the center oven rack and bake for 25 minutes. Rotate the pie 180 degrees, so the part that faced the back of the oven now faces the front, and bake about 20 to 25 more minutes. When done, the top will have puffed up and may show slight cracks around the edges. And most of the surface, except for the center, will have a "flat" - not shiny - appearance. Turn the oven off, open the door and slide out your oven shelf a little. Let the pie cool like that for 15 minutes. Then transfer to a cooling rack. When the surface of the pie has settled down, but it is still slightly warm, make the topping. Combine the sour cream and sugar in a small, heavy bottomed saucepan. Turn the heat to medium low and start heating the mixture very gradually, stirring almost nonstop. DO NOT LEAVE THIS UNATTENDED. IF IT BOILS, IT WILL SEPARATE. After about 4 to 6 minutes, when the sour cream is soupy and pretty warm to the touch, carefully pour it over the center of the pie. IMMEDIATELY pick up the pie and tilt the pan in all directions so the sour cream covers the pie and runs into the crust. Continue to cool. When the pie has cooled completely, cover it with a paper plate or aluminum foil tent and refrigerate overnight. 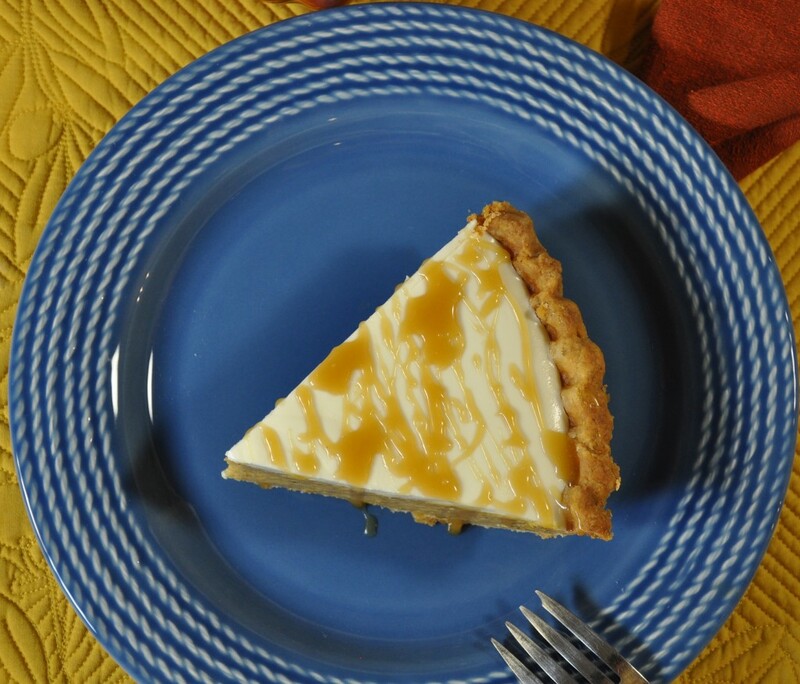 Slice and serve cold, topped with drizzles of caramel or butterscotch sauce if desired. Makes 10 to 12 servings. NOTE: Don't discard the beans; save and reuse for the same purpose.